"Critical Care Medicine At a Glance" provides an accessibly concise introduction to critical care medicine. It covers the core knowledge required by students and junior doctors for clinical attachments in critical and intensive care unit setting. The book follows the easy-to-use at a glance format of double page spreads composed of clear memorable diagrams that support accompanying key facts and essential information. The first part introduces key themes and covers general information, including looking at the management of the critically ill patient, oxygen transport and respiratory management, arterial blood gases and acid base balance and end of life issues. The correct use and dosage of drugs and what specialist equipment is necessary are also included. The second part is divided by systems, and examines critical illnesses in detail, their symptoms and causes and how to deal with every aspect in a critical care situation. Part three looks at surgical aspects covering topics from Trauma, Head injury, Chest trauma, Acute Abdominal Emergencies, Obstetric Emergencies, Burns, Toxic Inhalation and Electrical injuries. The book provides very much a hands-on approach to dealing with life-or death situations, providing examples and guidance on how to work effectively in a critical or intensive care unit. "Critical Care Medicine At a Glance" will be an essential resource for students, junior doctors on foundation programmes, and specialist nurses. It is ideal for clinical attachments and for those wishing to continue in critical care training. This book is designed to be an invaluable life-saving reference text and will fit even the tightest budget! 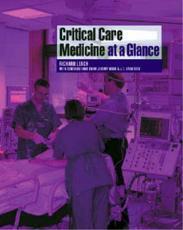 Pre-publication review quote: "A good introductory text to those wishing to continue in critical care training. The PRHO would find it useful to provide a quick summary of the likely management of the critically ill on his/her inpatient list." - Senior House Officer, John Radcliffe Hospital, Oxford.